When it comes to removing unwanted junk from your home, there are three categories: Easy, challenging and impossible. The easy items would be anything you can fit into the trashcan for the weekly pickup. Once it goes into the can, it is forgotten. Easy. The challenging items would be anything that you would have to load onto the back of your car and take somewhere else. It is challenging because your car can hold just so much. You also have to set aside the time to make the drop off, provided you know where to take those things. As for impossible, that would be everything else that can’t fit into your car because it’s too big or too heavy. For instance, what would you do if you needed to get take care of a hot tub removal task? Good thing there is a company like Junk King San Diego standing by to lend a hand. Junk King San Diego can take care of the easy, challenging and impossible junk removal tasks. Hot tub removal is going to take some extra time. The crews need to dismantle the tub in order to load it onto the truck. The best thing you can do to help with that is to make sure the hot tub is completely drained before the crew arrives. Other than that, you won’t have to lift a finger to get your hot tub remove. In one extreme case, a Junk King crew had to saw a hot tub in half to get it onto the truck. True story and there is even a video! Hiring Junk King San Diego to handle your hot tub removal might inspire you to clear the rest of you unwanted rubbish on the same appointment. The Junk King trucks are big enough to hold a hot tub and a few other items you want to get rid of. When you schedule your session with Junk King, they’ll ask about what you want to get rid of. A hot tub removal is going to take a little extra time but you won’t be charged extra. You’ll know the final prize before the work begins. 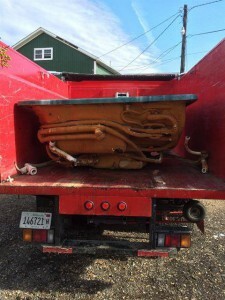 For dependable hot tub removal and junk hauling, you can always count on Junk King San Diego. This entry was posted in San Diego junk removal and tagged hot tub, Junk, junk King on October 31, 2017 by Junk King. Last updated November 2, 2017 .